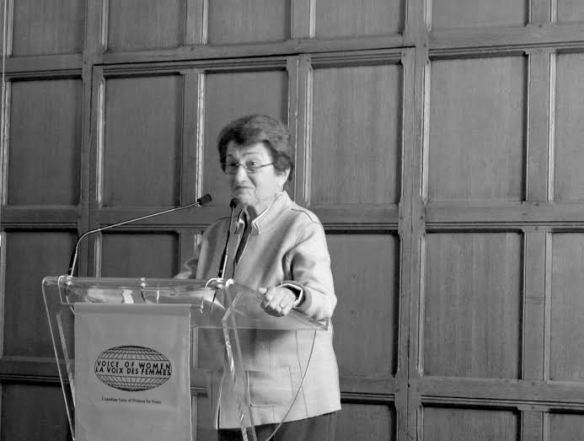 Cora Weiss, President of the Hague Appeal for Peace, has been a peace activist since the early sixties, when she co-founded Women Strike for Peace, which played a major role in bringing about the end of nuclear testing in the atmosphere. She was also a leader in the anti-Vietnam war movement, and organized one of the largest demonstrations in Washington, DC in 1969. She has devoted most of her life to the peace movement, the promotion of peace education, the movement for the advancement of women, and the civil rights movement, and has won numerous awards for her work. 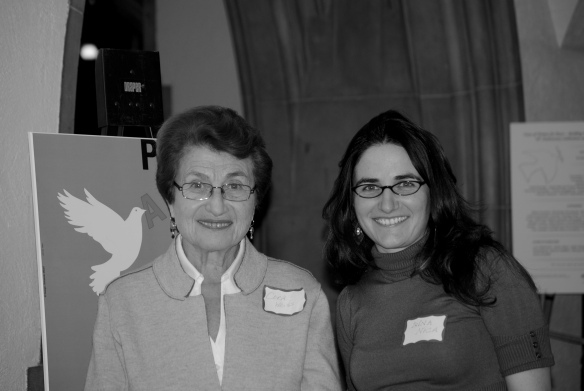 For more than a decade, Cora has been a strong supporter of Peace Boat US, and we are pleased to share this guest article about how her work has influenced the life of Elisaveta Nica over the past 45 years. It was during the 1969 -1970 academic year when a group of four students sitting around a table at a fancy coffee bar in Cluj Napoca, Romania became excited when I told them that I had read in Scinteia, a national newspaper, that an anti-Vietnam war movement was taking place in the United States. As I recall, the newspaper wrote about Cora Weiss, one of the most important leaders of the social movement against the Vietnam War, as well as about the increasing number of American students who participated in a large anti-war demonstration organized by Cora and other leaders. Stefan Cobzariu, one my classmates, joyfully confirmed that he also read this news, and the name of the young Cora Weiss stayed with him. This news was a revelation to us because we lived in a communist country that strictly controlled individuals and suppressed social movements. My enthusiasm about the news stirred discussion in the group about the significance of the event. We especially shared opinions about the role of the media in American society in highlighting the role and legitimacy of civil society in international state affairs. “And on top of that, a young woman was one of the significant leaders of the anti- Vietnam war movement in America,” continued Ioana Buruleanu, who was one of the most brilliant students enrolled in the Psychology program at Babes-Bolyai University. “I feel that Cora Weiss is not only a young woman, she is also intelligent and beautiful, because she has made an impact on students,” continued Ioana. “More than this, she gives a face to America,” I concluded. My perception of Cora was confirmed in 2014 by Susane Halladay, an American woman from Azusa whose husband is a Vietnam War Veteran, who enthusiastically told me: “I remember Cora Weiss! I loved her. She was a voice for Americans during the Vietnam War.” All of the comments of my university peers remained some of the most vivid memories of my university years because they connected me to something larger that I wanted to belong to. Furthermore, this memory inspired me when I created a Grammar Lesson Demonstration that focused on the topic the Culture of Peace project (COP), which I presented to my classmates at Azusa Pacific University in 2014. It was my memory of and appreciation for Cora’s impressive work on behalf of the American anti-war movement, the large-scale engagement of citizens, and my appreciation for Kim Phuc, the young, innocent Vietnamese girl who was famously photographed running naked and burned by napalm, and who later became a UNESCO Goodwill Ambassador, that inspired me to choose this topic for my academic assignment. Years had passed in a quick succession, I had completed university, gotten married, and raised four children. 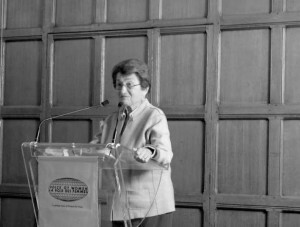 However, all the memories of the news and conversation about Cora Weiss’ actions stayed with me, and gave me new insights into the peace concept as a very complex process, and as a social and political construction—not just as an agreement between political and military leaders as I had been taught through my history studies at university. And to my own great benefit, I better applied this understanding of the peace concept while teaching history and social and political sciences to others, and in solving issues in my personal relations and professional community. Furthermore, I focused my personal reading on Romanian, American and Canadian figures of diplomacy who promoted peace in international affairs, and used this information when I gave presentations at the Tirgu Jiu District and at the Azusa Rotary Club in California in 2013. By studying English in Canada, I developed a greater understanding about the significance of Cora’s work based on civic partnership, both locally and globally, in promoting a culture of Peace, and later in international peace education as defined in The Hague Appeal for Peace. That’s why, while studying for a teaching license in Canada in 2010, I voluntarily created and coordinated the Student Culture of Peace and Development Project (SCOPDP) by collaborating with individuals and stakeholders in the field of education. An example of the modest beginning of this project can be found here. However, my move to California made me determined to adjust my project to the new context by disseminating COP values for peace education. It was the memory of news from the Romanian newspaper and my peers’ comments about Cora Weiss that motivated me to register for the Voice of Women (VOW) Conference in Toronto in 2010 after I saw Cora’s name as a keynote speaker on the conference program. The speech she delivered on that occasion showed her to be an electrifying orator and formidable motivator. I stood up and applauded enthusiastically, as did the entire audience. Cora’s speech gave me a new sense of purpose and motivated me to continue my work with the SCOPD project even when I faced many difficulties. Later, I wondered if Cora would focus her efforts on nuclear weapon, one of the hottest issues of today’s world. Cora’s invitation to the symposium for the launch of Betty Reardon’s new book in New York on March 5th, 2015, gave me the answer. In the official invitation, which she sent via email, Cora mentioned that she will apply her peace education knowledge to the campaign to implement the UN’s Security Council Resolution 1325 on Women Peace and Security, and to the abolition of nuclear weapons. Reading this reignited my enthusiasm for Cora’s actions in the field of peace and justice, and I felt her power and presence again as I had in 1969-1970. Cora is always thinking, pushing and challenging on behalf of a better world. Her speeches and engagement of communities for peace are a treasure in our generation. They should be integrated into school curriculums, and Peace Education should be taught all around the world. Elisaveta Nica is a Romanian-Canadian enrolled in the MA TESOL Program at Azusa Pacific University in Azusa, California. She has more than 15 years of international experience teaching history and social science in Romania, as well as working on the Culture of Peace Project (COP) in Canada and California during the past 5 years. Her work in COP includes founding the Student COP and Friendship Project, various presentations, published work, and academic research for assignments in peace and friendship literature. Elisaveta is passionate about helping ESL learners acquire English skills and create their own paths of development in their new environments. Her publication and research interests include literature and historical research on peace and friendship with application to education and international relations. She believes in creating and implementing concepts of the COP and Friendship for the educational ideal of building a new mentality and healing racial and national divisions. Peace Boat Celebrates World Oceans Day in New York! Join our mailing list for newsletters, event invites, etc.